American Roller Bearing Company manufactures a variety of specialty bearings customized to meet very specific needs. With our application, analytical, and design engineering capabilities, we will design, validate and manufacture the bearing you need. Whether it is customizing a standard design or starting from a concept, we have the capabilities to assure success. 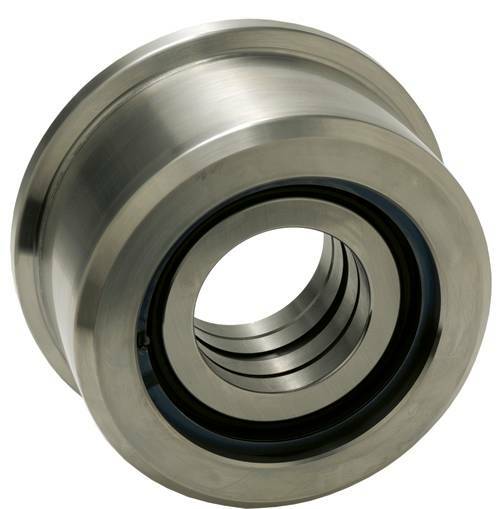 Split Bearings: radial and thrust bearings split to facilitate practical equipment assembly and service. Track Wheels: single flanged, double flanged or straight face for conveyor, chock wheels, etc. Bearings specially designed and manufactured to operate in extreme temperatures. Spherical Plain Bearings that accommodate heavy loads and misalignment. Ladder Bearings and Ball Bushings to accommodate linear loads. Bring us your bearing problems; we can help. 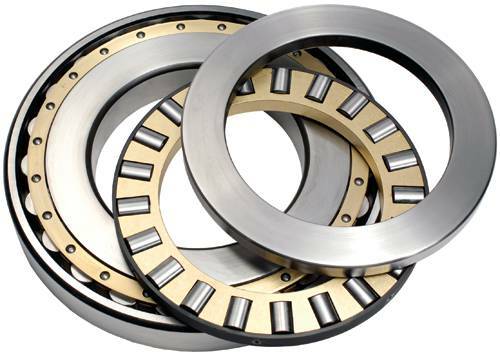 These bearings are very common in much smaller sizes, and are used in automobiles and many types of equipment. The 8.0 inch bore bearing to the right allows radial and axial forces to be transmitted as well as free rotation without imposing a bending moment on its shaft. 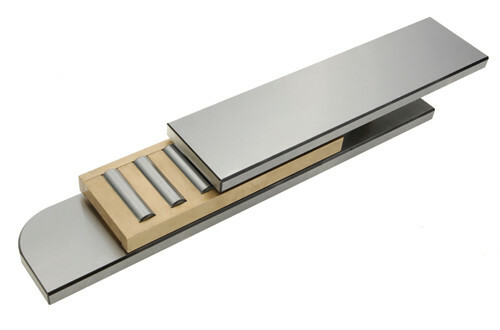 The two components of this example have been made with hard steel on hard steel, while other versions for other applications employ one component made from bearing bronze. The most common reason for employing a split bearing is to simplify the removal and replacement of its predecessor after its service time has expired. 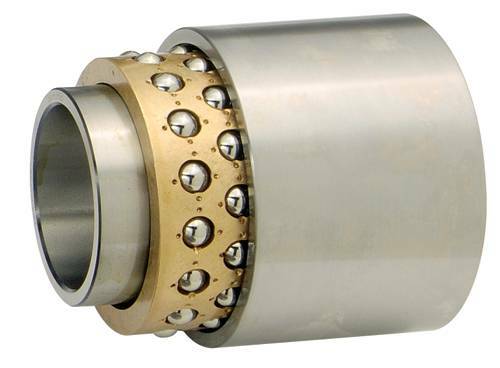 Cylindrical roller bearings are most commonly split, and are typically used in applications where the shaft has a shoulder on one side of the bearing and another component, such as a gear, coupling, etc. mounted on the other side. The old split bearing is unbolted and the halves are lifted off. The process is then reversed to install the new bearing. 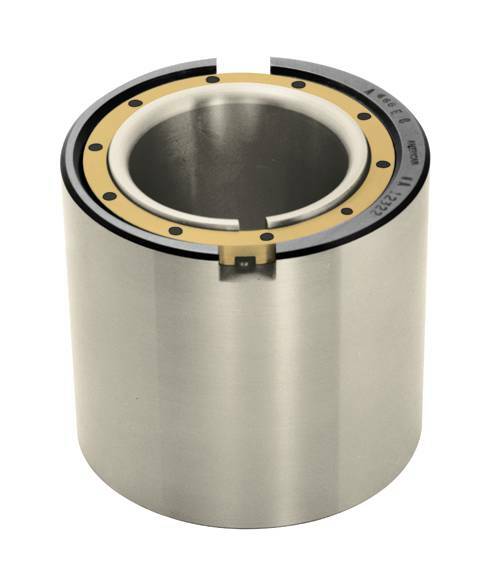 Smaller split bearings like the one shown are used on caster rolls. Larger size split bearings can be found on very long drive shafts on the order of 600mm and act as “center support” bearings. These bearings take advantage of limited space by allowing one race to perform the dual functions of a radial race and a thrust race. The amount of each load and the shaft speed need to be known in order to optimize the radial and thrust capacities of each part of the bearing for optimal service life. This type of bearing uses a conventionally designed cylindrical roller bearing with a spherical O.D. that fits inside an outer sleeve with a spherical I.D. allowing misalignment to occur without adversely affecting the rolling elements. When a straight inner race is used, axial shaft expansion is easily accommodated by the ground and lubricated surfaces. This is a much more reliable method of allowing axial expansion than trying to make an outer race O.D. slide in a dry machined housing bore. 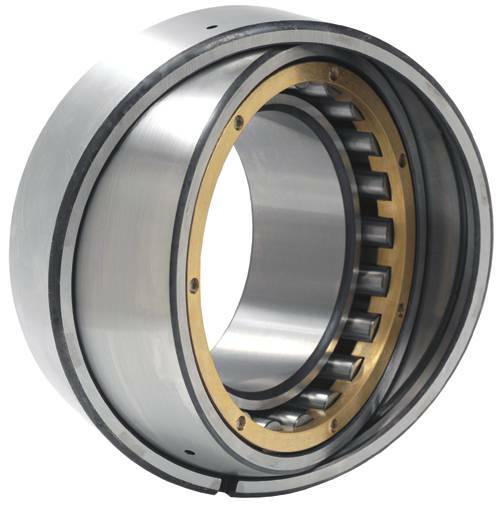 This unique type of bearing is designed to allow limited axial movement that occurs from thermal expansion or a repositioning of the heavy machine it supports. For balance, four ladder bearings are commonly used on one machine, with the ladder bearings underneath at the four corners. Usually pockets are provided in the base of the machine for the top races, while a matching set of pockets are created on the floor for the Bottom Races and the cage/roller assemblies fit in between. Grease lubrication is sufficient for these bearings, and sealing is provided by the machine manufacturer. This modified deep groove ball bearing is used in an application where mounting and dismounting would be very difficult if the typical shaft fit was used to prevent the Inner Race from turning and galling the shaft. The shaft fit has been adjusted to allow the inner race to easily slide onto the shaft for assembly and off for removal. To prevent the damage that would occur if the Inner Race turned on the shaft, a keyway notch is provided on the face of this race and it easily engages a key when slid into position. The outer race notches are simply grease passages. When a very large bearing for a piece of equipment is needed and no standard bearing exists, the equipment manufacturer will work with a bearing manufacturer to create a special bearing for his application. 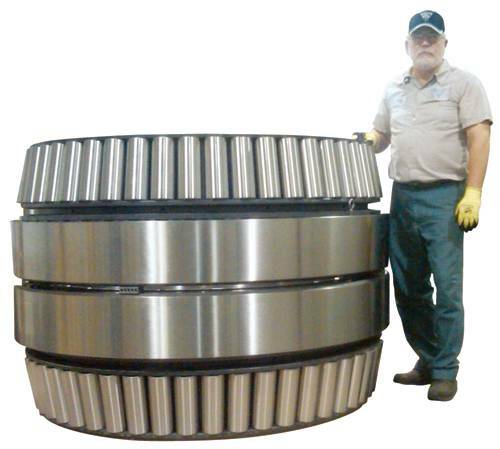 The various types of bearings found in this catalog can all be made as extra large bearings. 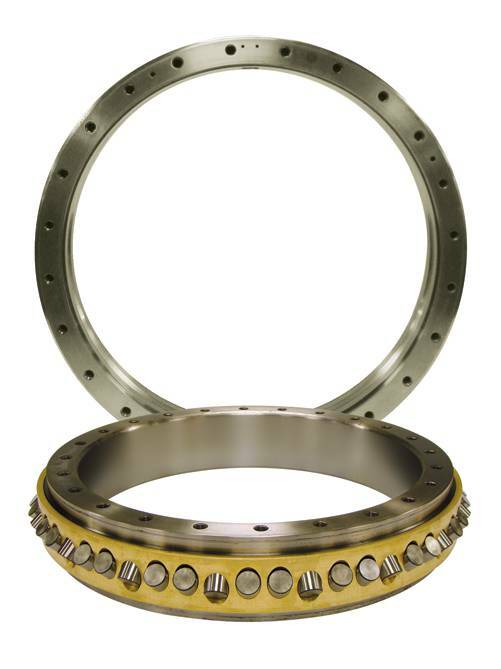 We've even manufactured a combined radial/thrust bearing as an extra large. 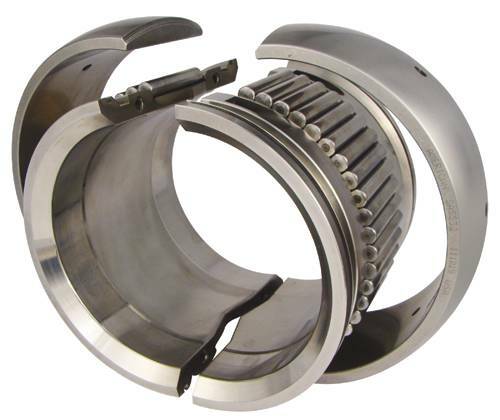 This bearing design offers its users a single bearing with a compact envelope that can accommodate radial, thrust and moment loading. The original application of a crossed roller, or “X” bearing, was that of replacing two radial bearings and a thrust bearing in a “kingpost” arrangement. When selecting a crossed roller bearing for an application, it is recommended that you contact American Roller Bearing so our engineering department can evaluate the arrangement with its anticipated loads and speeds. Large size crossed roller bearings are often supplied with inner race and outer race bolt holes for mounting and with seals. 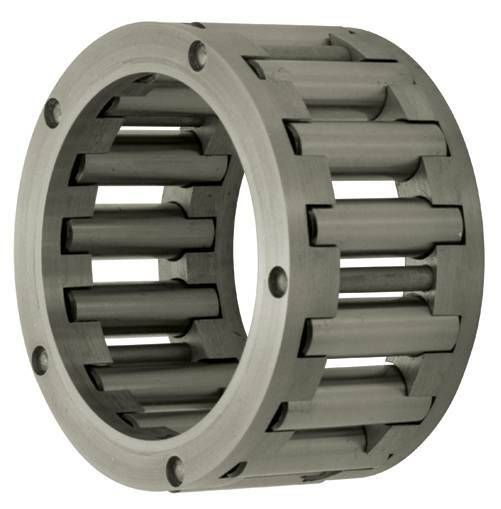 Track wheel and conveyor roll bearings employ a very thick outer race that acts as the wheel part of the bearing. This prevents the "wheel" from deforming under the relatively heavy loads it experiences. Track wheel bearings differ from conveyor roll bearings in that they have one or two outside flanges designed to follow the edge of a rail. 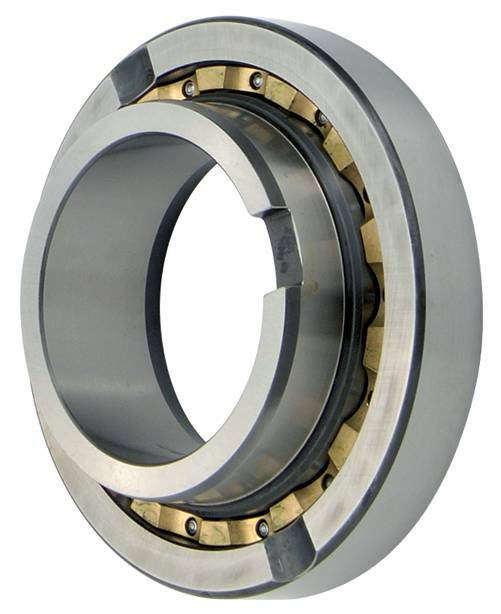 This type of bearing accommodates light radial loads while allowing rotation and free axial movement. Some versions are used in stamping presses to precisely align the top and bottom dies. 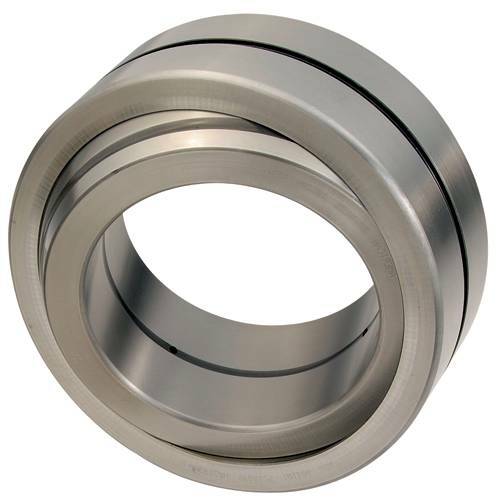 Other applications use this type of bearing to allow one part of a machine to slide while maintaining alignment on two axis. With rollers made from a tough, heat resistant tool steel, this type of bearing is capable of withstanding very high temperatures, some up to 1200 degrees Fahrenheit. Operation is either intermittent or of a short duration as there are no suitable lubricants available for such high temperatures. For much lower temperatures, up to 400 deg. F, special heat treating processes and various stainless steel alloys are used. The purpose of this special outer race feature is to allow the radial adjustments by turning the bearing’s outer race in its housing. Usually used as a rollneck bearing, with two per roll, the adjustability allows a precise radial gap to be created with parallel roll bodies.